House Concert at Lee Bartley’s in Mancos, CO.
May of 2013 offered me a unique experience of hosting my first house concert here in Mancos, Colorado, at Nancy’s and my house. 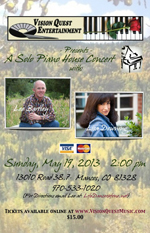 Again it was sold out, and featured my good friend, award winning solo pianist Lisa Downing in concert with me. Lisa and I have performed with Liz Story, Kathleen Ryan, Joseph Akins, and Julio Mazziotti, to name a few. The experience was so wonderfully received that another concert with Kathleen Ryan and myself is in the planning stages for the early summer of 2014 at our house.